Action from Peterborough Sports (blue) and Barton Rovers at the Bee Arena. Photo: James Richardson. 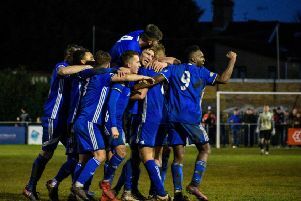 They didn’t return to the top of the table, but the Division One Central title in the Evo Stik Southern League is still in the hands of Peterborough Sports. The city side thumped Barton Rovers 4-0 at the Bee Arena in front of a crowd of 163 today (March 23), but leaders Bromsgrove Sporting pipped third placed Corby Town 2-1 to remain in first place. Lewis Hilliard shoots at goal for Peterborough Sports against Barton Rovers. Photo: James Richardson. Bromsgrove lead by a point, but Sports have two games in hand ahead of a tricky run of three away games in eight days. Sports are not impressed that Welwyn’s decision to postpone a fixture earlier in the season because of a player shortage has only been punished by a fine rather than the concession of the match. After a bright start from Barton today it was the hosts that took the lead on 21 minutes as Dion Sembie-Ferris cut inside and finished across visiting ‘keeper Gary Malone into the far corner. The second goal arrived five minutes before the break as a loose ball from a corner was eventually turned in by centre-back Stuart Wall. The visitors continued to compete on equal terms throughout the second-half before two late goals for Sports gave the final scoreline a harsh look for a spirited and dangerous Barton side. First Josh McCammon exchanged passes with Mark Jones on the edge of the box before driving home on 81 minutes before substitute Paul Malone returned to his goal scoring ways with a headed fourth from a corner in the last action of the game. Peterborough Sports players celebrate Stuart Wall's goal against Barton Rovers. Photo: James Richardson. Sports start their tricky run of away games with a trip to play-off chasing Thame United on Tuesday (March 26). It was a great day for Yaxley also as they moved six points clear of the drop zone with a 4-2 home success over AFC Dunstable. Dan Cotton scored twice with Charley Sanders and Joe Butterworth also on target for Yaxley who were twice pegged back after taking the lead in the first-half. Sixty supporters watched this game. Relegation from the East Division of the Northern Premier League now looks a very real prospect for Spalding United and Wisbech Town. Spalding are just three points and two places above the bottom two after losing to a goal six minutes from time at home to relegation rivals Stocksbridge Park Steels. And Wisbech are just a place above Spalding after losing 4-0 at fourth-placed Ossett United. Wisbech competed well until conceding three goals in six minutes early in the second-half. 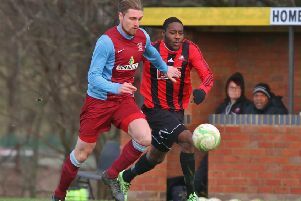 Stamford AFC threw away certain victory at Pickering Town. They led 2-0 at the break through goals from Greg Smith and Rob Morgan and were 3-2 entering injury time after a Joseph Boachie goal, but the home side found an equaliser in the 90th minute. East Division: Ossett Utd 4, Wisbech Town 0; Pickering Town 3, Stamford AFC 3 (Smith, Morgan. Boachie); Spalding Utd 0, Stocksbridge Park Steels 1. Division One Central: Peterborough Sports 4 (Sembie-Ferris, Wall, McCammon, Malone), Barton Rovers 0; Yaxley 4 (Cotton 2, Sanders, Butterworth), AFC Dunstable 2.